As a kid, I was never super skinny, but I wasn’t overweight either. Eventually, “life happened” and, after finishing grad school, all of my time became consumed with the usual grind and made no time to take care of myself. I put everything before me: job, home, and my kids. Somehow, my annual physical exam and tests came out aces — my physician even said I had the heart rate of an Olympic athlete! So for years I convinced myself that I was just fat on the outside but fit on the inside. With age, though, I became more aware of the health problems that come with getting older. 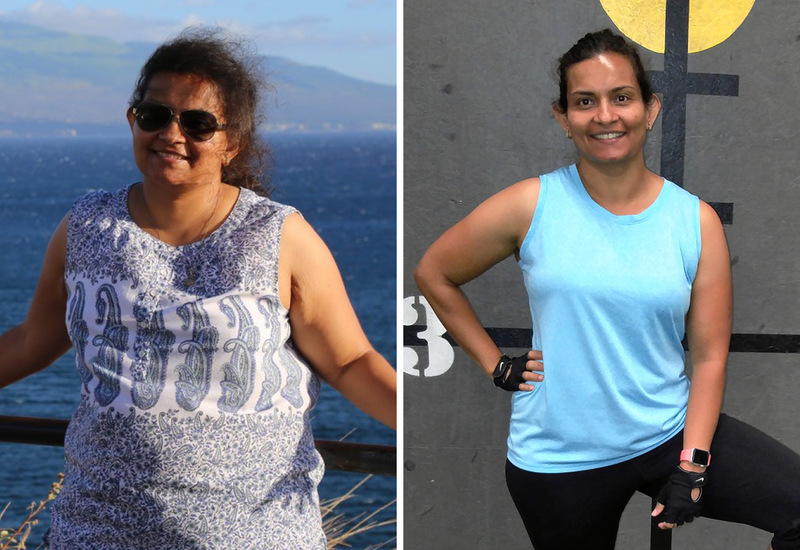 I understood that my knee pain was caused by the excessive weight I had been carrying since my first pregnancy, and I feared the possibility of becoming a diabetic. Aside from the medical reasons, I didn’t like how big I looked. Shopping for clothes was a depressing experience, I avoided getting photographed (so much so that there aren’t many pictures of me with my kids), and some of my relatives made snide remarks about my size. I hated the thought I could be setting a bad example for my kids, and that they would, at some point in the future, be embarrassed about me. I wanted to be fit for my health, my confidence, and my self-esteem, and I was ready to do whatever it took — but first I had to come back from two broken ankles. I had spent the first half of 2016 in bed rest, rehab, and hours of daily physical therapy. It was during these physical therapy sessions, when I would see how people – mostly senior citizens – were dealing with various types of joint and muscular issues, that I learned the importance of exercise and mobility at every stage of life. I was in my mid-thirties and already I had been feeling pain in my knees when I biked or went up and down the stairs at home. The women in my mother’s side of the family have a history of knee problems, and my mom even had both knees replaced a few years ago. I didn’t want that for myself. As soon as I got the all-clear from my physiotherapists and podiatrist in the last week of August 2016, I checked into ClubSport San Jose. There, I took an InBody body analysis and the results shattered my “fit on the inside” theory! I weighed just under 191 pounds and had 46.1 percent body fat, and my visceral fat level was 20. To put things into perspective, a body fat percentage of 32 and above is considered obese in women, and a visceral fat level of 10 and below is healthy. Basically, I needed to lose 57.1 pounds of body fat. Easier said than done, but I was determined. I made a list of things I needed to do to avoid the medical conditions I was at risk of and it boiled down to four things: regular exercise, correct nutrition, getting 7-8 hours of quality sleep, and avoiding stress. I put this list and my InBody results on my bathroom mirror as a daily reminder. I learned about REV32 the same day I did my InBody analysis. I knew nothing about exercise other than using the treadmills and elliptical machines, and had no idea about strength and resistance training. It was clear I needed an expert to guide me in my fitness journey. I loved that it came with nutritional guidance because, while I ate mostly home-cooked food, I was clueless as to what I could change to make my nutrition healthier. Also, the idea of a supportive REV32 community was a big plus because we can all go further with a support system. Then I learned about coach Jessica Phillips’ own transformation story, and I knew there was no excuse for me not to be able to do it. I signed up for the next session of REV32. In the six weeks leading up to my first REV32 session, I worked out on my own every day and with a personal trainer once a week. I started to see my numbers move in the right direction and couldn’t wait to put my workouts in high gear with REV32. My first day of REV32 was October 24, 2016, and I immersed myself in the program. I attended the nutrition talk, which taught me what, why, how much, and when to eat. Some of the things I learned were eye-openers for me, like the fact that fruits can be detrimental to your weight loss efforts. I learned about leaky gut, gut inflammation, metabolic syndrome, and how to work around them. And I also learned about how so many so called “healthy” foods were affecting my health and weight loss results. Then there were the food demos, which introduced me to healthy cooking practices and some tasty and healthy recipes. I picked up new cooking habits and styles from my REV32 community. I also experienced new foods and vegetables that I had never tried before. Because I was determined to get results, giving up certain foods or taking new ones came easy to me. I switched to stevia, avoided all the sweet stuff, and increased my protein intake. The only thing I didn’t do a good job at was food logging, mainly because I was still eating mostly Indian food and I was too lazy to explain what it was. I fixed this later when I found MyFitnessPal, which made food logging easier because of its ability to break down macros of every type of food. As a huge bonus, as soon as I changed my eating habits, I lost my chronic heartburn. The REV32 workouts became the highlight of my day. I challenged myself at every workout, pushing harder than the day before. I would be so tired by the end of the day that I slept like a log. Going back to my fitness plan, REV32 directly took care of the first three items: exercise, nutrition, and sleep. The fourth item, which was avoiding stress, came as a byproduct of REV32. The combination of being able to work with some of the best trainers to improve my fitness, seeing my progress, and the general feeling of happiness due to all the endorphins released by regular exercise gave me satisfaction. I felt very fortunate to have found this program. I enrolled in a second session of REV32, and this time, I was more determined to dial in my nutrition. I started incorporating fish in my diet 3-4 times per week, not because I liked it, but because it’s the healthiest source of protein. I initially struggled to learn to cook fish and meats in the oven correctly, but with time, practice, and experience (and with a good meat thermometer), I became good at it. I eliminated all types of grains, breads, and other foods that may be processed, and turned to lots of raw, sautéed, grilled greens and baked or grilled fish and chicken breasts. I tracked my macros to the last gram, picked up lots of recipe ideas from the REV32 community Facebook page and online. With these dietary changes and regular food logging, my results expedited. 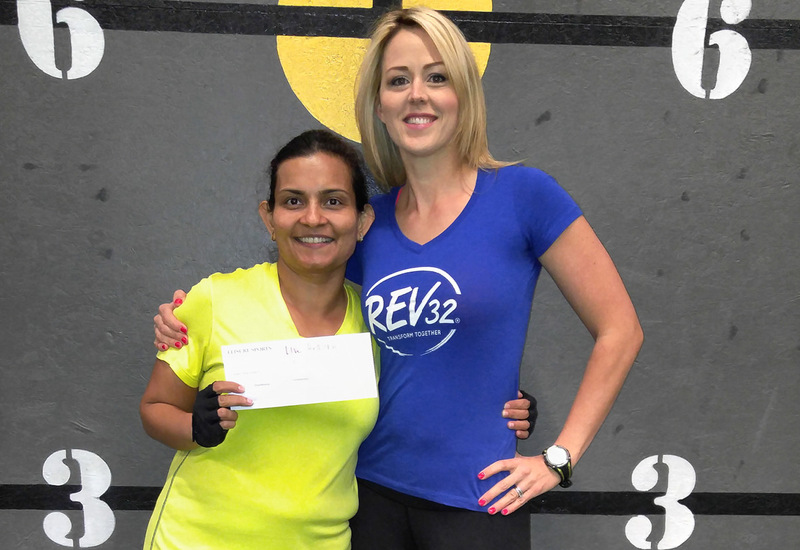 It was during this session of REV32 that ClubSport announced they were hosting the Live Healthy Challenge, an eight-week body composition challenge with a $2,500 grand prize for the winner. Since I was already giving my all to REV32, I thought that winning this challenge would be icing on the cake. When I was announced as the winner, I felt that all my hard work had been validated and acknowledged. And when strangers at the club stopped to congratulate me on my victory and results, I felt like a minor celebrity! I went on and did a third session of REV32. By the end of my third session, I had lost over 33 pounds of pure body fat (12 points of body fat from my InBody results), nine levels of visceral fat, and six dress sizes, all while gaining muscle mass. In April 2017, I hit my lowest weight in over 10 years! However, the most important thing is what I gained: lifelong healthy cooking and eating habits. Now, my family eats nutritious food that’s easy to cook, smells delish, and leave you feeling healthy. I’m now at a happy stage in my life where I enjoy every type of food in moderation without gaining weight. Thanks to REV32, being mindful of what I eat has become part of my nature. The knowledge and confidence that I gained has allowed me to sustain my results even after moving on from the program. I love working out regularly and am continuing to lose fat. My kids have also picked up on my healthy eating habits, help me in the kitchen during meal prep, and are interested in fitness and nutrition. I enjoy shopping for clothes now, feel younger and confident, and no longer hide from the camera. Most importantly, my kids and husband are very proud of me. I highly recommend REV32 to anyone looking to take charge of their health or fitness. This program gives you all the tools you need to reach your goals, from intense workouts to nutrition guidance to a supportive community. This program has been a life-changer for me. For anyone seeking to commit to their fitness but doesn’t know where to start, this is the answer.